All links open in new pages or new tabs. CC’s On The Rideau - 1030 Rideau Ferry Road (County Rd #1), Rideau Ferry, ON - A full-service restaurant with plenty of indoor and outdoor areas right on Big Rideau Lake, with boat access via Municipal docks. It's not just the chef but the ingredients that makes a dish fantastic. CC's on the Rideau serves up fresh and funky food using only the finest locally sourced ingredients. LCBO & Beer Store Outlets, Gas Bar & The Rideau Ferry Country Store in Rideau Ferry - 1040 Rideau Road (County Rd #1), Rideau Ferry, ON K0G 1W0 - All purpose convenience store. Featuring: A bakery, breakfast, sandwiches, video rental, groceries, ice cream, gifts and crafts, dry cleaning depot and a full service gas bar. LCBO and Beer Store agency. Jimmy's Snack Shack - 1040 Rideau Ferry Road (County Rd #1), Rideau Ferry, ON - Open all year round! Call ahead or visit. Open from 11-8pm. Jimmy will cater your party or event too! Big or small! Sew Crafty: Here you will find a wide selection of fabrics, notions, quilting and needlework supplies. Ferry Garden: Offers perennials, statuary, bulbs and outdoor living products. Rideau Lakes Cafe: Offers fair trade coffee and at least 20 different loose leaf teas. They do espressos, cappuccinos and lattes as well, and offer home-made treats and various desserts. Cold Drinks are also available and we even have coke in glass bottles all in a comfortable, relaxing atmosphere overlooking the Rideau Lakes. BIG Rideau Lake Association (BRLA) - Located on the Big and Lower Rideau Lakes in Eastern Ontario, the Association is committed to long-term environmental protection and service to all who use the lake and share its resources. The Big Rideau Lake Association supports programs in the areas of environment, recreation, government affairs and lake safety. Murphy’s Point Provincial Park - Located on Big Rideau Lake, part of the historic Rideau Waterway, the park features hiking trails groomed in the winter for skiing, car and RV camping, group camping, and backcountry camping (boat-in sites on the Rideau). Rideau Ferry Yacht Club Beach \ Conservation Area - Bask on the beach and listen as the water laps onto the shore at the Rideau Ferry Yatch Club Conservation Area. The former Rideau Ferry Yacht Club donated this 10 acre shoreline property located at Rideau Ferry to RVCA in 1976 for the purpose of providing a public day use recreation area with access to Lower Rideau lake. Rideau Valley Conservation Authority maintains a public beach, boat launch, and picnic area at this popular summer park. Rideau Canal World Heritage Site - An extensively researched website that includes practically everything you need to know about the the Rideau Canal — a National Historic Site of Canada, a Canadian Heritage River and a UNESCO World Heritage Site. Friends of the Rideau - Friends of the Rideau is a non-profit organization made up of volunteers who care passionately about the Rideau Canal. Pat’s Boating in Canada - This website is an excellent resource for boaters in Canada. • Making A VHF Radio Distress Call: MAYDAY - Transmit this "mayday" VHF call to indicate your vessel or a person is in distress and requires immediate assistance. Transport Canada, Office of Boating Safety - On this official website you can download the latest Safe Boating Guide, apply for a Pleasure Craft licence, take a boating safety course, etc. Canadian Power and Sail Squadrons - Canadian Power and Sail Squadrons is a non-profit organization that has been connecting boaters for over 75 years and continues to play a major role in Canadian boating culture. GPS Marine Navigation Apps for handheld devices by Navionics - One of the world’s most popular marine & lakes GPS apps. Download marine charts for the Rideau Canal and Rideau Lakes. Being situated midway on the Rideau Canal, Rideau Ferry Harbour offers the unusual opportunity for visitors to explore the area’s historic towns, villages and locks in either direction by car or by boat. Interactive map of the canal locks. We boast plenty of onsite amenities and there is no shortage of fabulous attractions close by. You can enjoy lunch or dinner at a nearby lakeside restaurant, snack stand, or coffee & dessert shop. A convenience store with groceries and an LCBO outlet inside the store, and roadside gas station, are all a short drive away. 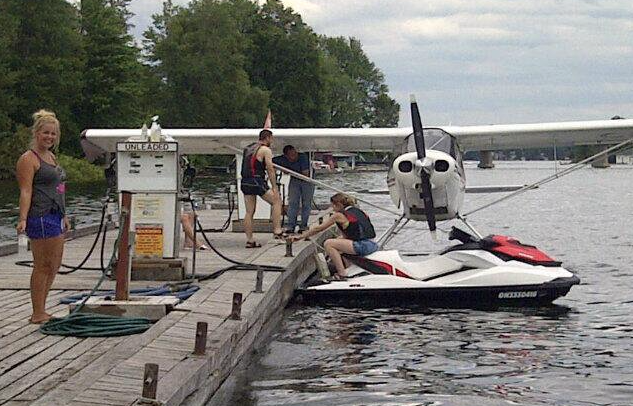 They can also be accessed by water on Rideau Ferry’s municipal docks. Your email address and contact information are secure and will not be shared.